Do I have to bring in other contractors? No. In addition to cabinetry, our expert installers are experienced and fully trained to handle all plumbing and lighting installations. We clean as we go and will also remove and dispose of old cabinets and counter tops, so you are not required to hire outside contractors. I am having an addition built, can you work with my contractor? Yes. Diamond State Cabinetry is happy to work along side contractors on your renovations or additions. How long will it take once I have chosen my cabinets? After you have selected your cabinets, it takes about 2 - 3 weeks for them to arrive. Once they have arrived, your kitchen can be installed in as little as two days. We can install a temporary sink and counter top if the installation is delayed due to your counter top installation. What will this cost? Can I finance? The cost of each project varies, but you will be surprised at how affordable your custom cabinetry can be. Financing options are available. You can call us at (302) 250-3531 or contact us online to request an estimate and consultation. Can you build custom bars or built-ins? Yes. 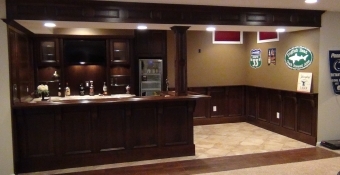 In addition to cabinets, we also build custom desks, built-ins, bookcases, bars, center islands, and more. Let us know what you have in mind, and we will work with you to come up with an affordable custom solution. What are your guarantees and warranties? We offer warranties from 3 years to limited lifetime, depending on the line of cabinets you choose. Satisfaction guarantee and warranty is included in your estimate. 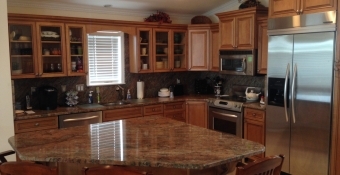 Diamond State Cabinetry has been in business for 10 years, and our design expert has over 24 years of experience. 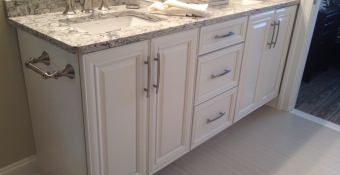 This experience gives us the ability to convert your wants and needs into the perfect custom kitchen or bath. Our showroom is located at 23094 Lewes Georgetown Highway, Georgetown, Delaware. You can find driving directions to our location here. Yes. 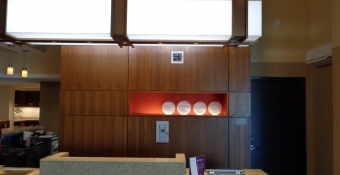 Click here to view our photo galleries with examples of our kitchen, bath, and bar work.